This year I got (I think) my first ever teacher Christmas card. It is red, gold and glittery, and says "For my teacher at Christmas time" on the front. Aww. 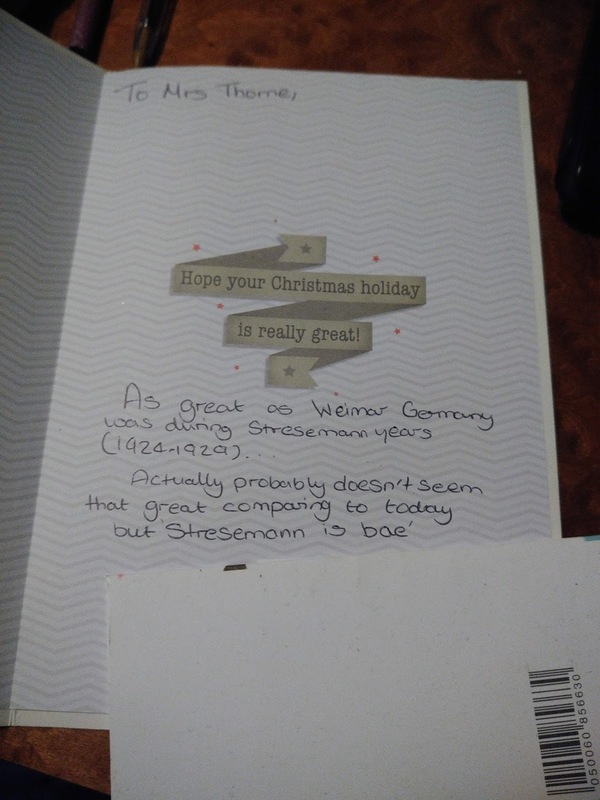 I think it was bought in a game of on upmanship being played by two rivals in my year 11 class, to outdo the smaller card given to me by the other one the previous day, but I'll take it. Love what she wrote inside. I always go on about Stresemann being my favourite 1920s German politician. I draw a little heart by his name when I write it on the board, so the message is completely contextually accurate. Love my history geeks.